Talking about Tifinagh and multi-script typefaces as a way to normalise cultural diversity in multi lingual environments. Image: E. Herrera. 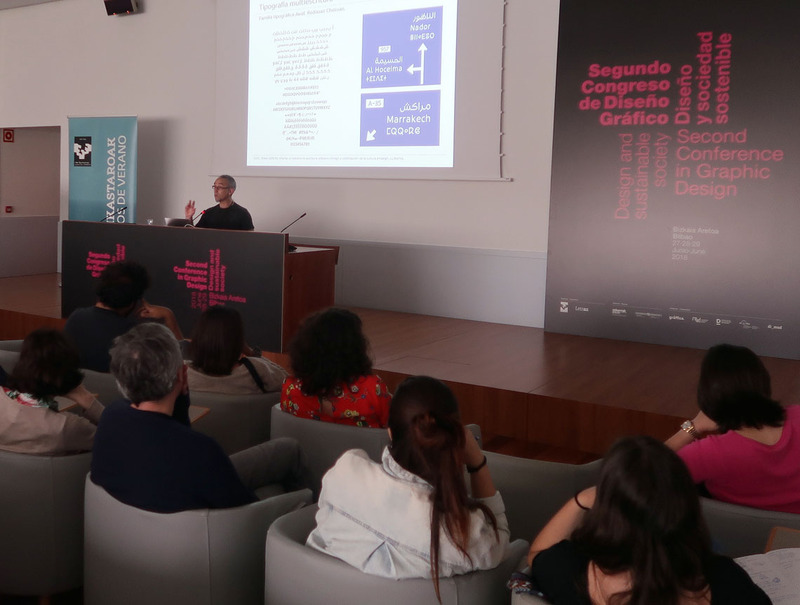 From 27 to 29 June 2018 the Second Conference in Graphic Design, organised by the Graphic Design Department of the University of the Basque Country took place in Bilbao. The theme of this edition was “Design and sustainable society” and I was given the opportunity to talk about Tifinagh. Various aspects concerning the link between Graphic Design and sustainability were discussed: gender, accessibility, environment, identity, activism… It was the ideal context to talk about how Type Design may help normalising the presence of minority languages and scripts in multicultural areas, in this particular case giving voice to the Tifinagh script in a context in which it has been displaced and marginalised for ages. It was interesting to see to what extent an ancient script used in a several neighbour countries of North Africa is completely unknown for Basque/Spanish graphic designers and graphic design students. During my talk I showed some of the scarce examples of type design works that have engaged in multi-script approaches covering the Tifinagh script in recent times, from academic works like my own Amaikha or the tri-script signage typeface Awal (R. Chetouan), to the more ambitious collective project Typographic Matchmaking in the Maghrib. The latest, in which I was fortunate to be involved in, has resulted in three interesting and award winning projects (Elixir, Qandus and Tubqal) that will be released as libre fonts soon. I would like to take this opportunity to thank the organisation of the conference for giving me the opportunity to contribute to the spread of the Amazigh culture and its fascinating script, the Tifinagh.